A Reg 1, 12V 200W capability. A Reg 6, for 6V 200W capability. A Reg 3, for 3 phase 200W capability. 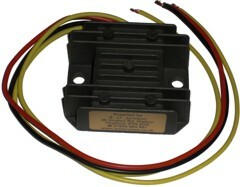 Polarity:-These units can be wired Positive or Negative Earth to the motorcycle. It is essential that the Positive and Negative output of these units meets the battery Positive and Negative exactly the same. All three units have the same dimensions is 60 X 66 X 25mm with 6mm fixing holes at 55mm. Unit is best fitted to a flat metal surface (can be painted) as a basic heat sink. Full instructions come with each unit. They can be used without a battery but it is advised to use a Capacitor, (We can supply) especially if you have coil/electronic ignition (not essential if using magneto ignition) Be aware that with a stalled engine you no longer have lights, horn or stop light. Batteries:- I have always advised that the minimum capacity should be 5Ahr for any Classic British Motorcycle using traditional Lead Acid. Modern AGM batteries would appear to be acceptable. Cyclon cells of 5Ahr or more are also usable. What is not suitable is the 'square' 'dryfit' type with spade terminals (often surplus from burglar alarms). These will overcharge in due course and dry out.